This is a handcrafted one-of-a-kind Toothpick Dispenser turned out of a single piece of Oak Wood from a 400 year old Valley Oak Tree in my yard. The piece has a very distinctive grain pattern with a beautiful sunburst ray pattern on the top, a lengthwise knot down the front, and a wormhole pattern along the side. The top pull is fashioned from a piece of Rosewood which contrasts nicely with the warm colors of the oakwood. 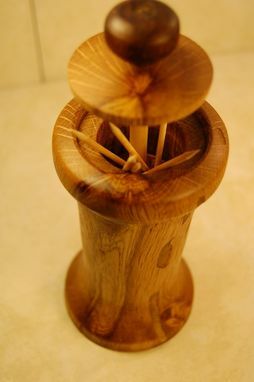 When you pull up the top, toothpicks burst out from within, and close back inside when the top is returned. The piece bears the crafter's initials on the bottom as well as the year it was made. It is finished in Lemon Oil.